Miami Trace sophomore Dylan Bernard (11) blocks the shot of McClain senior Trevor Newkirk during a Frontier Athletic Conference game at McClain High School in Greenfield Friday, Jan. 18, 2019. Bernard had two blocks in the game. 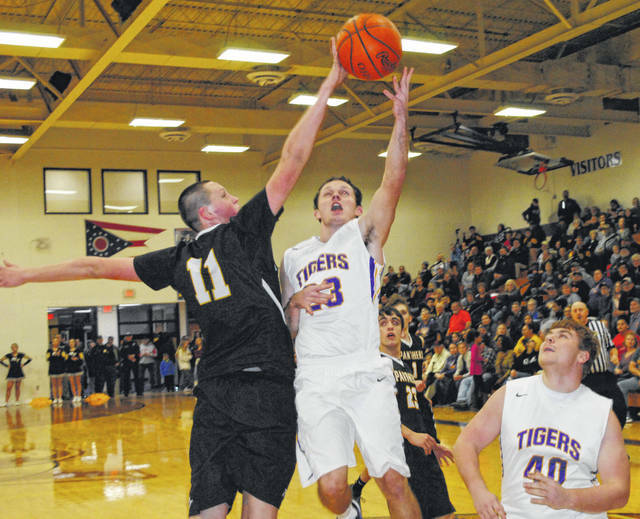 Also pictured for Miami Trace is junior Cody Brightman and for the Tigers, junior Dakota Pollock (40). GREENFIELD — A packed house inside of McClain High School’s gymnasium on Friday was treated to a superb third quarter of basketball by the home-standing Tigers as they outscored the visiting Miami Trace Panthers 30-3 in the period en route to a 67-34 Frontier Athletic Conference win. Miami Trace started the game hot from the three-point line as Trevor Barker and Kyler Conn each hit two three pointers and Conn totaled eight points in the period as Miami Trace trailed 17-16 after one quarter of play. The Panthers took a brief lead early in the second quarter when Cameron Moore and Ethan Steele scored seven points for Miami Trace as they took a 23-20 lead. Logan Rodgers had the lone field goal for the Panthers in the third as he hit a layup following a Miami Trace timeout with just over five minutes to play in the third. The fourth quarter was a formality with McClain leading the Panthers 58-27 but McClain’s Ethan Cockerill took the opportunity in the opening minutes of the quarter to score two buckets and push the McClain lead to 62-27 before he was subbed out of the game. Miami Trace is scheduled to take the floor again on Friday, January 25 when they travel to Hillsboro to take on the Indians in an FAC match-up. Their game at home against Lynchburg-Clay, scheduled for Saturday, has been postponed. McClain is scheduled to travel to Dayton-Caroll on Tuesday to compete with Patriots in a non-conference match-up. Miami Trace is now 1-14 overall, 0-7 in the FAC. The Tigers are now 4-3 in the Frontier Athletic Conference. MIAMI TRACE — Trevor Barker 0 (3)-0-9; Kyler Conn 0 (2)-2-8; Ethan Steele 1 (1)-0-5; Logan Rodgers 2-0-4; Cody Brightman 0 (1)-0-3; Cameron Moore 1-0-2; Austin Mathews 0-1-1; Braden Osborne 0-1-1; Austin Brown 0-1-1; Dylan Bernard 0-0-0. TOTALS — 4 (7)-5-34. Free throw shooting: 5 of 15 for 33 percent. Three-point field goals: Barker, 3; Conn, 2; Steele, Brightman. Field goal shooting: 11 of 33 for 33 percent. Three-point field goal shooting: 7 of 11 for 63 percent. Rebounds: 20 (3 offensive). Assists: 7. Steals: 8. Blocks: 3. Turnovers: 27. Personal fouls: 16. Bench points: 17. Second chance points: 2. Points off turnovers: 12. McCLAIN — Kobe Penwell 1 (6)-2-22; Dalton Mischal 7-2-16; Devin Carter 4-0-8; Bryson Badgley 2 (1)-0-7; Garrison Banks 2 (1)-0-7; Ethan Cockerill 2-2-6; Dakota Pollock 0-1-1; Trevor Tite 0-0-0; Zane Mustard 0-0-0; Theo Dehecq 0-0-0; Trevor Newkirk 0-0-0; Reece Schluep 0-0-0. TOTALS — 18 (8)-8-67. Free throw shooting: 7 of 11 for 63 percent. Three-point field goals: Penwell, 6; Badgley, Banks. Field goal shooting: 26 of 53 for 49 percent. Three-point field goal shooting: 8 of 17 for 47 percent. Rebounds: 29 (7 offensive). Assists: 9. Steals: 13. Blocks: 0. Turnovers: 16. Personal fouls: 18. Bench points: 8. Second chance points: 6. Points off turnovers: 22.